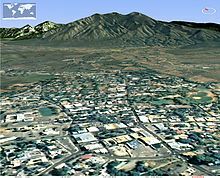 Taos /taʊs/ is a town in Taos County in the north-central region of New Mexico in the Sangre de Cristo Mountains, incorporated in 1934. As of the 2010 census, its population was 5,716. Other nearby communities include Ranchos de Taos, Cañon, Taos Canyon, Ranchitos, El Prado, and Arroyo Seco. The town is close to Taos Pueblo, the Native American village and tribe from which it takes its name. Taos is the principal city of the Taos, NM Micropolitan Statistical Area, which includes all of Taos County. The Taos Pueblo, which borders the north boundary of the town of Taos, has been occupied for nearly a millennium. It is estimated that the pueblo was built between 1000 and 1450 A.D., with some later expansion, and the pueblo is considered to be one of the oldest continuously inhabited communities in the United States. Located in a tributary valley off the Rio Grande, it is the most northern of the New Mexico pueblos. The pueblo, at some places five stories high, is a combination of many individual homes with common walls. There are over 1,900 Taos Puebloans living within the greater pueblo-area community. Many of them have modern homes near their fields and live there in summer months, only staying at their homes within the main North or South pueblo buildings during cooler weather. 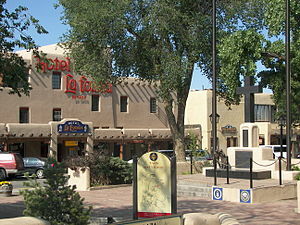 About 150 people live within the main pueblo buildings year-round. The Taos Pueblo was added as a UNESCO World Heritage Site in 1992. Taos was established c. 1615 as Don Fernando de Taos, following the Spanish conquest of the Indian Pueblo villages. Initially, relations of the Spanish settlers with Taos Pueblo were amicable, but resentment of meddling by missionaries, and demands by encomenderos for tribute, led to a revolt in 1640; Taos Indians killed their priest and a number of Spanish settlers, and fled the pueblo, not returning until 1661. Between 1780 and 1800, Don Fernando de Taos (now Taos) was established. Between 1796 and 1797 the Don Fernando de Taos Land Grant gave land to 63 Spanish families in the Taos valley. It was built as a fortified plaza with adobe buildings and is now a central plaza surrounded by residential areas. Mountain men who trapped for beaver nearby made Taos their home in the early 1800s. Mexico ceded the region to the U.S. in the Treaty of Guadalupe Hidalgo in 1848 after the Mexican–American War. After the U.S. takeover of New Mexico in 1847, Hispanics and American Indians in Taos staged a rebellion, known as the Taos Revolt, in which the newly appointed U.S. Governor, Charles Bent, was killed. New Mexico was a territory of the United States beginning 1850 and became a state in 1912. Beginning in 1899, artists began to settle in Taos; six formed the Taos Society of Artists in 1915. In time, the Taos art colony developed. Many paintings were made of local scenes, especially of Taos Pueblo and activities there, as the artists often modelled Native Americans from the pueblo in their paintings. Some of the artists' studios have been preserved and may be viewed by visitors to Taos. These include the Ernest L. Blumenschein House, the Eanger Irving Couse House and Studio—Joseph Henry Sharp Studios, and the Nicolai Fechin house, all of which are listed on the National Register of Historic Places. Influential later 20th-century Taos artists include R. C. Gorman and Agnes Martin. Taos is home to more than twenty sites on the National Register of Historic Places. About 3 miles (4.8 km) north of Taos is Taos Pueblo; Picuris Pueblo is about 25 miles (40 km) south. Located just North of the Taos Plaza, this street was the location of Governor Charles Bent's home. Governor Bent was scalped and killed by Pueblo warriors during the Taos Revolt, on January 19, 1847. During the Taos Revolt, Bent’s horses were set free from their stable. Many of the historic sites are homes and studios of artists, including the Mabel Dodge Luhan House, Eanger Irving Couse House and Studio—Joseph Henry Sharp Studios, the Nicolai Fechin House, the Leon Gaspard House, and the Ernest Martin Hennings House. Doc Martin's restaurant in the historic Taos Inn was previously the office of Thomas "Doc" Martin while other parts of the inn served as his home and the birthplace of the Taos Society of Artists. On Ledoux street, just south of the Taos Plaza, is the Ernest L. Blumenschein House and Harwood House. The Helene Wurlitzer Foundation is a non-profit organization that provides free residency to eleven artists, with each year divided into three residency sessions of three months apiece. The center of the Taos Downtown Historic District is the Taos Plaza. Just west of that is the Our Lady of Guadalupe Church. North of the Taos Plaza is the Governor Charles Bent House and the Taos Inn. Further north in Taos The Bernard Beimer House. On the southwestern edge of the Taos Historic district is La Loma Plaza Historic District. East of the plaza on Kit Carson Road is the Kit Carson House. North of Taos is the Turley Mill and Distillery Site and the Rio Grande Gorge Bridge. Just outside Taos in Ranchitos is the Martinez Hacienda, the home turned museum of the late Padre Antonio José Martínez. South of Taos is the Ranchos de Taos Plaza with the San Francisco de Asis Mission Church. About 20 miles (32 km) northwest is the D. H. Lawrence Ranch (originally known as the Kiowa Ranch and now owned by the University of New Mexico), the home of the English novelist in the 1920s. It is believed that his ashes are buried there at the D. H. Lawrence Memorial. Another novelist who lived for a while in Taos was Alexander Trocchi. There are three art museums in Taos: Harwood Museum of Art, Taos Art Museum and Millicent Rogers Museum that provide art from the Pueblo Native Americans, Taos Society of Artists and modern and contemporary artists of the Taos art colony. The town has more than 80 art galleries, and there are several houses of the Taos Society of Artists. There are several local venues for the performing arts in Taos. The Taos Center for the Arts (TCA) draws nationally renowned and local performers at the Taos Community Auditorium. They also present independent film series. Three chamber music groups perform at TCA: Taos School of Music, Taos Chamber Music Group, and Music from Angel Fire. The Harwood Museum of Art is site of other performances and lectures. The Town of Taos Convention Center offers a venue for other local performances. The Taos Talking Pictures Film Festival was a film festival held in the town from the mid-1990s to 2003. The festival's top prize was 5 acres (2.0 ha) of land. The Taos valley, Rio Grande and Taos mountains provide many opportunities for recreation, such as fly fishing, horseback riding, golfing, hot air ballooning, llama trekking, rafting, and mountain biking. The South Boundary trail, east of town, is consistently ranked the best mountain bike trail in New Mexico. There are also numerous hot springs along the Rio Grande and in the Taos Mountains. Among them a historical site called Stage Coach, which used to double as a brothel during the times of the Old West. Nearby, the Cumbres & Toltec Scenic Railroad provides a ride through the Toltec Gorge and Rocky Mountain passes in an authentic narrow-gauge steam railroad. In the winter, many people come to Taos to ski in the mountains. Nearby Wheeler Peak, at 13,161 feet (4,011 m), is the highest peak in New Mexico. The Taos area has four ski areas – Taos Ski Valley, Red River ski area, Sipapu (ski area) and Angel Fire ski area. Other winter activities include hot air ballooning, horseback riding, snow-shoeing, cross-country skiing, ski skating, ice skating, ice fishing and snowmobiling. As of the 2010 census Taos had a population of 5,716. The median age was 44. The ethnic and racial composition of the population was 40.1% non-Hispanic white, 0.7% African American, 1% Asian, 5.3% Native American, 0.3% non-Hispanics reporting some other race, 5.4% reporting two or more races and 51.9% Hispanic or Latino of any race. As of the census of 2000, there were 4,700 people, 2,067 households, and 1,157 families residing in the town. The population density was 874.5 inhabitants per square mile (337.6/km2). There were 2,466 housing units at an average density of 458.8 per square mile (177.1/km2). The racial makeup of the town was 68.04% White, 0.53% African American, 4.11% Native American, 0.62% Asian, 0.11% Pacific Islander, 21.66% from other races, and 4.94% from two or more races. Hispanic or Latino of any race were 54.34% of the population. In the town, the population was spread out with 23% under the age of 18, 6.6% from 18 to 24, 26.4% from 25 to 44, 27.8% from 45 to 64, and 16.2% who were 65 years of age or older. The median age was 41 years. For every 100 females, there were 85 males. For every 100 females age 18 and over, there were 81.3 males. Taos is located at 36°23′38″N 105°34′36″W﻿ / ﻿36.39389°N 105.57667°W﻿ / 36.39389; -105.57667 (36.393979, −105.576705). The town has a total area of 5.4 square miles (14 km2), all land. Taos is located near the Rio Pueblo de Taos, a tributary of the Rio Grande. Just to the west of Taos is the Rio Grande Gorge, cutting through the basalt flows of the Taos Plateau volcanic field and crossed by the Rio Grande Gorge Bridge, now a part of U.S. Route 64. The elevation of the town is 6,967 feet (2,124 m). Just north of Taos is Wheeler Peak, at 13,161 feet (4,011 m), the highest point in New Mexico. Taos has a semi-arid climate (Köppen BSk) with extreme diurnal variations of temperature and low rainfall. Even when summer days get extremely hot, nights can be pleasantly cool. The town's public schools operated by Taos Municipal Schools include Arroyos del Norte Elementary School, Enos García Elementary (also Taos Elementary School), Ranchos Elementary School, Taos Middle School, Taos High School and Taos Cyber Magnet School. Charter schools include Anansi Charter School, Taos Academy (State Charter), Taos Municipal Charter School and Vista Grande High School. Also in the area are additional alternative and private schools: Chrysalis Alternative School, Sped Discipline, Yaxche Private School, Taos Christian Academy, and San Francisco De Asis School. Dallas-based Southern Methodist University operates a 295-acre (119 ha) campus at Fort Burgwin in Taos. Albuquerque-based University of New Mexico (UNM) operates a community campus in Taos, with eight affiliated buildings in Taos, such as the UNM Harwood Museum of Art and Taos High School where some classes are held. The Earthship Academy (or Earthship Biotecture Academy) is offering training in Earthship design principles, construction methods and philosophy. Earthship is a particular type of sustainable architecture and design, based around solar power. The town of Taos is incorporated under the mayor-council form of government. The town was incorporated on May 7, 1934. The town seal is a logo of the town of Taos with the year of incorporation "1934" in the center, and on the outer edge, the words "Town of Taos, New Mexico". The elective officers of the town include the mayor, four members of the governing body forming the town council, and a municipal judge. The town council is the board of finance of the town. The town manager and finance director serve as the nonvoting members to the board of finance. Key positions within the town government are town manager, appointed by the major, Town Attorney, Town Clerk, Town Engineer and Chief of Police. Taos is predominantly made up of Democrats; in 2008, approximately 74% of registered Taos County voters were Democrats, 13% were Republicans and about 13% identified with other parties or declined to affiliate with a party. The RTD Chile Line, operated by the North Central Regional Transit District (NCRTD), is Taos' only public transportation system. It provides fare-free in-town service as well as seasonal service up to the Taos Ski Valley. The transit system also provides paratransit service for citizens with special needs and ensures that all route buses are American Disability Act (ADA) equipped. The RTD Taos Express promotes local tourism and provides weekend express service, for a nominal fee, from the Taos Plaza to the New Mexico Rail Runner, Santa Fe Municipal Airport, and Santa Fe transit. The North Central Regional Transit District (NCRTD) has public transportation service into the Town from throughout Taos County and the Counties of Santa Fe, Rio Arriba and Los Alamos. The Taos region has service to Cerro, Penasco, Questa, Red River, the Rio Grande corridor and the University of New Mexico – Taos Klaur campus. At the Espanola Transit Center, passengers can connect to other regional routes, such as Espanola, Santa Fe, Los Alamos, and Northern Pueblos area. In 2003 the Regional Transit District Act was enacted, which authorized the creation of Regional Transit Districts (RTD's) in the state of New Mexico; In September, 2004, the North Central Regional RTD was the first RTD to be certified by the New Mexico Transportation Commission. Taos Regional Airport (SKX) is under the direct supervision of the Town of Taos. The airport is located just a few miles north of the Town of Taos on U.S. Route 64 towards the Rio Grande Gorge Bridge. Other airports in New Mexico include the Santa Fe Municipal Airport and Albuquerque International Sunport. El Crepusculo de la Libertad was the first Taos newspaper, which began in 1834 with the first printing press west of the Mississippi. Its successor The Taos News, which also does business as El Crepusculo, is the primary printed newspaper in Taos. The Taos News, a weekly online and print publication. Sangre de Cristo Chronicle serves Angel Fire, New Mexico, Red River, Cimarron, Eagle Nest, Taos, Las Vegas, Questa and Sipapu. Taos News is an online news site by Topix that pulls and reports news articles about Taos. There are two local cable television stations: Taos Local Television Public Access Channel 2 and Channel 22. See also List of television stations in New Mexico. KKIT 95.9 FM "The Mountain", pop, rock, classic rock. KKTC 99.9 FM "True Country". KLNN 103.7 FM Adult contemporary music. KRRT 90.9 FM Top-40, local transmitter for the University of New Mexico's KUNM. KTAO 101.9 FM Solar radio station with an adult album alternative music format. KVOT 1340 AM Religious (Christian) music. KXMT 99.1 FM Radio Exitos is the local 24-hour Spanish radio station serving Taos, northern New Mexico and Southern Colorado. KYBR 92.9 FM Spanish. Located in Española, but serves Santa Fe and Taos as well. Legendary country music artist Waylon Jennings sang a song titled "Taos, New Mexico" on his 1967 album Love of the Common People. On September 18, 1991, the PBS TV series Reading Rainbow shot its 73rd episode "The Legend of the Indian Paintbrush" here. The title was based on a book by Tomie dePaola and was narrated by Harold Littlebird (born 1951). Santa Fe's Dominic C. Arquero introduced himself at this program's beginning. The Rio Grande Gorge Bridge is featured in the 2009 film Terminator: Salvation, the 1994 crime-drama film Natural Born Killers, and in the 2007 comedy Wild Hogs. The film Garbage Warrior documents architect Mike Reynolds who builds Earthships in and around Taos. Two characters in television series were portrayed as having originally been law enforcement officers in Taos. Deputy Marshal Sam McCloud in McCloud (played by Dennis Weaver), and Sheriff Victor Galindez as Gunnery Sgt. in JAG (played by Randy Vasquez). Taos has been featured in The Nine Lives of Elfego Baca (1960) and And Now Miguel (1966). In the DC Comics animated series, "Young Justice (TV Series)", Taos is often featured as the location of a STAR Labs base of operations, specialising in Zeta Beam research and "Meta-Human" housing for minors. An ongoing low-frequency noise, audible only to some, is thought to originate somewhere near this town and is consequently sometimes known as the Taos Hum. Those who have heard the Hum usually hear it west of Taos near Tres Orejas. The Taos Hum was featured on the TV show Unsolved Mysteries, and it was also briefly mentioned in an episode of The X-Files. It was the basis for the TV series Criminal Minds episode "Mixed Signals". ^ a b "About Taos Pueblo FAQs". Taos Pueblo. Archived from the original on 2016-10-25. Retrieved 2016-10-31. ^ "Taos Pueblo". UNESCO World Heritage Centre. Archived from the original on 2016-06-20. Retrieved 2016-10-31. ^ a b c "Taos Timeline". Taos County Historical Society. Retrieved 2011-06-03. ^ "Koshare Indian Museum: Taos, New Mexico". Retrieved 2014-07-07. ^ a b Taos Downtown Historic District. National Park Service. Retrieved 2014-07-28. ^ a b Taos History. Archived 2015-01-21 at the Wayback Machine Taos Chamber of Commerce. Retrieved 2014-07-28. ^ Zora O'Neill (2006). Santa Fe, Taos, & Albuquerque. Moon Handbooks. p. 95. ISBN 978-1-56691-879-4. Retrieved 2009-07-24. ^ Crane, L (1972). Desert drums: the Pueblo Indians of New Mexico, 1540–1928. Rio Grande Press. ^ Whaley, B; Stiny, A. "Reconsidering Art in Taos; Bert Phillips" in Taos Horse Fly. Taos Daily. Archived from the original on 2012-03-10. Retrieved 2009-02-17. ^ "Taos County, New Mexico". National Register of Historic Places. U.S. Dept. of Interior, the National Park Service, and the National Register of Historic Places. Retrieved 2011-06-04. ^ "Art Today". Taos Vacation Guide. Taos Webb Community. Retrieved 2011-06-04. ^ "Art History". Taos Vacation Guide. Taos Webb Community. Retrieved 2011-06-04. ^ "Performing Arts". Taos Vacation Guide. Taos Webb Community. Retrieved 2011-06-04. ^ Domrzalski, D (2003-12-07). "Taos Talking Pictures drops curtain". New Mexico Business Weekly. Retrieved 2011-06-03. ^ Domrzalski, D (2004-03-14). "Three festivals rise out of Taos Talking Pictures' ashes". New Mexico Business Weekly. Retrieved 2011-06-03. ^ "Film Festival Awards". Taos Land and Film Co. Retrieved 2011-06-03. ^ "Mountain Bike Trails near New Mexico". MTB Project. Retrieved 2016-04-09. ^ "Summer". Taos Vacation Guide, Recreation. Taos Webb Community. Retrieved 2011-06-04. ^ "Winter". Taos Vacation Guide, Recreation. Taos Webb Community. Retrieved 2011-06-04. ^ "Taos Town, New Mexico Complete Analysis". citymelt.com. Retrieved 2011-06-04. ^ Zora O'Neill. "Geography and Geology". >Home>Santa Fe, Taos & Albuquerque from Moon Santa Fe, Taos & Albuquerque, 2nd edition. Avalon Travel Guides. Retrieved 2011-06-04. ^ a b "Frequently Asked Questions". Taos Vacation Guide. Taos Webb Community. Retrieved 2011-06-04. ^ "Climate Summary". WRCC. Retrieved 2011-09-08. ^ "Taos Municipal Schools". Taos Municipal Schools. Retrieved 2011-06-04. ^ "New Mexico Charter Schools" (PDF). New Mexico Public Education Department. Retrieved 2011-06-04. ^ "All Taos elementary, middle and high schools (search criteria)". Find a School. GreatSchools, Inc. Retrieved 2011-06-04. ^ "Southern Methodist University (SMU)". Southern Methodist University, Dallas, Texas. Retrieved 2011-06-04. ^ "University of New Mexico – Taos". University of New Mexico. Retrieved 2011-06-04. ^ "Campus map". University of New Mexico – Taos. University of New Mexico. Retrieved 2011-06-04. ^ "Chapter 3.12 Form of Government". Sterling Codifiers, Inc. Retrieved 2011-06-04. ^ "Chapter 3.16 Town Seal". Sterling Codifiers, Inc. Retrieved 2011-06-04. ^ "Chapter 3.20.010 Elective Officers of Town (Ord. 98-2 § 1, 1998: prior code § 2-2)". Sterling Codifiers, Inc. Retrieved 2011-06-04. ^ "Chapter 3.24 Board of Finace". Sterling Codifiers, Inc. Retrieved 2011-06-04. ^ "Town of Taos". Sterling Codifiers, Inc. pp. 3.36, 3.40, 3.44, 3.52, 3.56. Retrieved 2011-06-04. ^ "Government - Legislative - Mayor and Council Members". Town of Taos. Retrieved 2014-04-03. ^ Chambers, P (2008-09-14). "Taos County Republicans open local campaign headquarters". The Taos News. Retrieved 2011-06-04. ^ "Transportation Services Chile Line". Town of Taos. Retrieved 2011-06-04. ^ "Taos Express". Town of Taos. Retrieved 2011-06-04. ^ "New Mexico Airports". Red Cirrus, LLC. 2011. Retrieved 2011-06-04. ^ "About Taos News". The Taos News. Archived from the original on 2009-08-15. Retrieved 2011-06-04. ^ "Sangre de Cristo Chronicle". El Crespusculo/Sangre de Cristo Chronicle. 2011. Retrieved 2011-06-04. ^ "Taos Local Television Public Access Channel 2". TLTPA. Retrieved 2011-06-04. ^ "Taos Local Television Public Access Channel 22". Comcast. Retrieved 2011-06-04. ^ "Radio Stations in Taos, New Mexico". Radio-Locator.com. Retrieved 2012-05-19. ^ a b c d e "Radio Stations in Taos, NM". Ontheradio.net. Retrieved 2011-06-04. ^ "KKTC". RadioinTaos.com. Retrieved 2011-06-04. ^ "Luna 103.7 KLNN". KLNN. Retrieved 2011-06-04. ^ "KVOT". RadioinTaos.com. Retrieved 2011-06-04. ^ "KXMT". Ontheradio.net. Retrieved 2011-06-04. ^ "The Legend of the Indian Paintbrush". Reading Rainbow. Alabama Public Television (PBS). Retrieved 2011-06-04. ^ "The Legend of the Indian Paintbrush". Myths and Legends, PBS Teachers. PBS. Retrieved 2011-06-04. ^ "Terminator Salvation: Set Locations Revisited". TheTerminatorFans.com. 2010-01-28. Retrieved 2011-06-03. ^ "Rio Grande Gorge Bridge". New York Times. New York Times, content from Frommer's Santa Fe, Taos & Albuquerque, 12th Edition. 2011. Retrieved 2011-06-04. ^ "Goofs for Wild Hogs (2007)". IMDb. Retrieved 2011-06-04. ^ "Garbage Warrior". HESO Magazine. October 7, 2009. ^ McLellan, Dennis. "From the Archives: Dennis Weaver, 81; Star of 'Gunsmoke,' 'McCloud' Also Was Environmental Activist". latimes.com. Retrieved 2017-01-31. ^ Maddrey, Joseph (2016). The Quick, the Dead and the Revived: The Many Lives of the Western Film. McFarland. Page 182. ISBN 9781476625492. ^ "Taos Hum". The Unexplained. Unsolved-Mysteries.com. Retrieved 2011-06-03. ^ "X-Files script 602". Inside the X. DrWeesh. Retrieved 2011-06-03. ^ "Ross Anderson profile". Ross Anderson. Retrieved 2011-06-03. ^ Hafen, LeRoy R. (1997). Fur trappers and traders of the far Southwest : twenty biographical sketches. Utah State University Press. ISBN 0874212359. OCLC 37400891. ^ "Gary Johnson: 'Ron Paul and Myself' Can 'Grow the Base'". ABC News. 2011-02-10. ^ Baker, Peter (2013). Days of fire: Bush and Cheney in the White House. Doubleday. p. 233. ISBN 978-0-385-52518-3. Bleiler, Lyn; Society of the Muse of the Southwest (2011). Taos. Images of America. Charleston: Arcadia Publishing. ISBN 978-0-7385-7959-7. Crane, Leo (2010) . Desert Drums: the Pueblo Indians of New Mexico, 1540–1928 (Reprint ed.). Whitefish, MT: Kessinger Publishing. ISBN 978-1163176870. Herold, Laurance C.; Luebben, Ralph A. (1968). Papers on Taos Archaeology. Taos, NM: Fort Burgwin Research Center. OCLC 55484. John, Elizabeth Ann Harper (1996) . Storms Brewed in Other Men's Worlds: The Confrontation of Indians, Spanish, and French in the Southwest, 1540-1795 (2nd ed.). University of Oklahoma Press. ISBN 978-0806128696. O'Neill, Zora (2006). Santa Fe, Taos, & Albuquerque. Moon Handbooks. Avalon Travel Publishing. ISBN 978-1-56691-879-4. Wikimedia Commons has media related to Taos, New Mexico. Wikivoyage has a travel guide for Taos.